United States, Revenues, Dealer Stock, #R1b/RU13d, Identified on #102 cards and housed in red box, some light duplication, a useful group, worth a look, generally Fine to Very Fine. United States, Revenues, Mint Duck Accumulation, n.h., Mostly $15 denominations in multiples, face value $2,677, Fine to Very Fine. United States, Revenues, 1936 to 2010 Duck Accumulation, #RW3/RW77A, RW3 to RW39 o.g. with some h.r., some gum creases, catalog $2215, RW40 to RW77A n.h., face $875, dupl. up to 4, generally Fine to Very Fine. United States, Revenues, 1946 to 1968 Duck Block Group, Blocks of 4, #RW13-RW16, RW32-RW35, n.h., RW13-16 usual gum bends, RW16 wrinkle on two and gum skips on one, Fine to Very Fine. 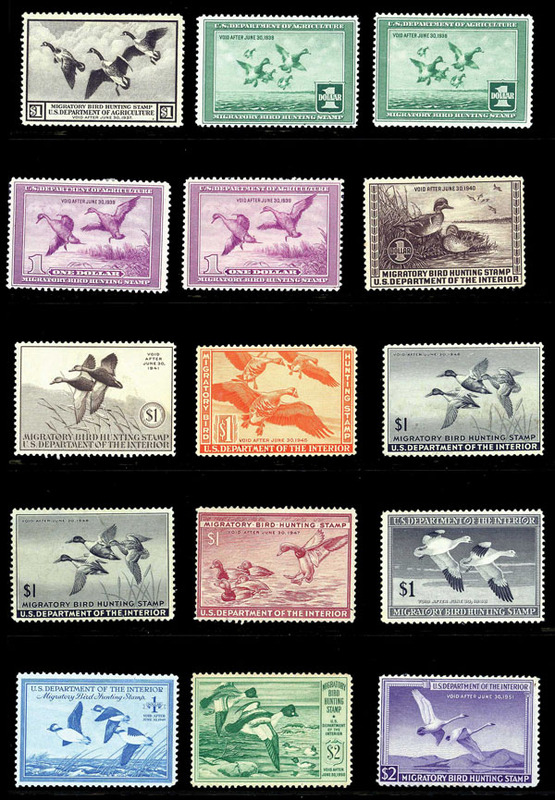 United States, Revenues, 1934-1993 Duck Collection, #RW1-RW60, RW1-RW33 and RW36 unused, RW34-RW35 and RW37-RW60 n.h., straight edge on RW6, RW7, RW9 and RW10, gum crease on RW3 and RW5, otherwise fine or better. United States, Revenues, Modern Duck Collection, Collection from 1973 to 2015, mostly n.h. plus few earlier used, Fine to Very Fine. United States, Revenues, Graded Ducks, n.h., all graded XF 90, #RW40, RW43 (2), RW44 (2) RW45, RW48, RW54, RW56, RW57 and RW73b, 2006 P.S.E. certs. United States, Revenues, 1971 to 1989 Duck Blocks, Blocks of 4, #RW38-RW56, n.h., face $522, Fine to Very Fine. United States, Revenues, Canceled Checks With Revenues, Several hundred from late 19th to early 20th Century from Lentz Table Co. and Fifth Avenue Bank, duplication but worth a look, generally Fine to Very Fine. United States, Revenues, State Duck Revenues, Identified and in #102 cards from CA, KS, IA, MA, MD, MI, NH, NJ, ND, TX, UT, VA, WI, WV, incl. Pheasant, Upland Game, Archery, Firearms, Quail, Public Access, Bow & Arrow, etc., generally Fine to Very Fine. United States, Revenues, 1990's Duck Group, n.h., small lot of Federal ($15) and Washington state ($6) singles and plate blocks (45 stamps total), face value $450.